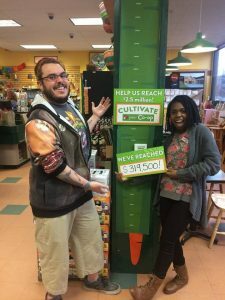 Food Co-ops on the Grow! And as we grow the Co-operative Economy, we are also growing more good jobs, purchasing more from more local farmers and producers, and building more inclusive communities. Here’s to a Co-operative New Year in 2019! The Neighboring Food Co-op Association (NFCA) 8th Annual Meeting & Member Gathering is coming up on Saturday 23rd March 2019. This day-long training and networking event is a free event for up to four representatives of our Member Co-ops, including General Managers and Board Chairs, and other designated Staff and Board Members. 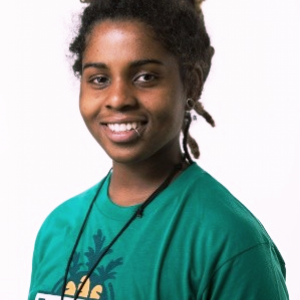 As we continue our dialog around the role of our food co-ops at the intersection of diversity, economic inclusion, food security, and climate change, we are excited to welcome as our keynote speaker Ruth Tyson, Coalitions Coordinator for the Food & Environment Program at the Union of Concerned Scientists (UCS). Ruth facilitates the Good Food for All coalition, uniting grassroots and national organizations around a vision for a just, equitable and sustainable food system, and transforming the food system through policy advocacy. Look for more information soon. In the meantime, please contact Bonnie Hudspeth for more information (bonnie@nfca.coop). As the partial federal government shutdown — now the longest in U.S. history — drags on, its negative impacts are rippling across the economy, sometimes in unanticipated ways. The news is full of stories of federal workers and contractors struggling to make ends meet. Meanwhile, the National Farmers Union is calling for an immediate end to the shutdown and impacts on family farmers and rural communities (see story below). The impasse could affect people and their families in our communities who depend on SNAP benefits (also known as food stamps) because they are processed by federal employees of the Agriculture Department. Many of these workers have been furloughed, as detailed in this recent article in the Greenfield Recorder, “Shutdown Could Affect Food Stamp Benefits“. Most SNAP recipients were able to receive their February benefits early, but the federal government’s shutdown mitigation plan does not have a contingency plan for March. This SNAP schedule change means families in our region and across the country will need to stretch a small amount of money over a longer period of time and not have enough food to feed their families. Food co-ops are supporting their communities to address this gap in food security at this difficult time in a number of ways. Efforts include support in shopping on a budget, bulk buying options, and donations to local food banks. Many of our food co-ops also have need-based “Food for All” programs that offer an every day discount on healthy food for people who qualify for SNAP and other food assistance programs. These discount will continue to be available even if these benefits become unavailable from the federal government during the shutdown. The Neighboring Food Co-op Association (NFCA) has been working in collaboration with partners including the Cooperative Fund of New England, Hunger Free Vermont and the New England Farmers Union to strengthen food security in our region through the development of Healthy Food Access programs such as “Food for All,” “Co-op Basics,” “Pennywise Pantry,” and “Co-op Cares,” creating new approaches to making healthy food and community ownership of our food system and economy more accessible to everyone. See examples of our Co-op’s work in Healthy Food Access: http://nfca.coop/healthyfoodaccessprograms/. 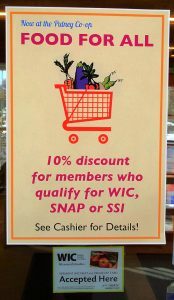 And to find a food co-op near you, visit: http://nfca.coop/members. One of our family’s favorite recipes is Risi e bisi, an Italian dish made with rice, parmesan cheese, and peas! We learned how to make this dish when our children were young from our friend and author, Norah Dooley. She includes the Risi e bisi recipe in her children’s book “Everybody Cooks Rice”. The story is set in a neighborhood at dinner time where in each home a meal is being prepared using rice. A variety of cultural dishes are introduced as the stories behind why they are family favorites are revealed. While the recipes have particular spices or vegetable and meat combinations all are pretty easy to prepare like Risi e Bisi! Our co-ops have the ingredients needed to make simple, nutritious, creative, and family favorite meals. By including Northeast grown vegetables during these winter months, you can keep family farmers thriving all year and have quality ingredients for your favorite meal. 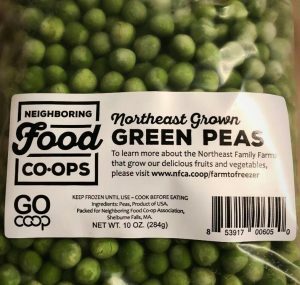 Neighboring Food Co-op Association (NFCA) Blueberries, Organic Edamame, Organic Green Beans, non-GMO Sweet Corn and Green Peas are available year-round and easy to use in your favorite recipe and available only at your food co-op! Use a pot with a tight cover. In a bowl, dissolve bouillon in 2 cups of water, then add the rest of the water. Set aside. Over medium heat, cook garlic and onion in olive oil until the onion is transparent. Don’t let the garlic turn brown. Turn off the heat right away and pour in the rice. Stir in the 4 cups of water and dissolved bouillon and cook on highest heat until the mixture boils. Lower heat and do not remove lid. Cook for 25 minutes. If using frozen peas, soak them in warm water. when the rice is cooked, add the peas, stir in Parmesan cheese, and sprinkle with nutmeg. The vision of the Neighboring Food Co-op Association is of a thriving co-operative economy, rooted in a healthy, just and sustainable food system and a vibrant community of co-operative enterprise. Bringing Northeast grown fruits and vegetables to you by your co-op is a part of this sustainable food system, supporting family farmers all year long. Dorset, from Consider Bardwell in Pawlet, Vermont is a washed-rind, raw Jersey cow cheese with a rich, buttery texture and seasonally influenced pungency. Earthy and complex with a beautiful basket weave rind, Dorset is a savory, nutty and earthy delight that is perfect for a cheese plate or melted with vegetables or bread. 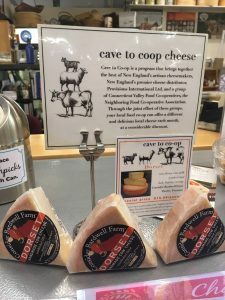 Spanning the rolling hills of Vermont’s Champlain Valley and easternmost Washington County, New York, 300-acre Consider Bardwell Farm was the first cheese-making co-op in Vermont, founded in 1864 by Consider Stebbins Bardwell himself. A century later, Angela Miller and Russell Glover are revitalizing the tradition with goat milk from their herd of Oberhaslis and cow milk from their two neighbor farm partners—the Brooks and the Browes. Rotational grazing on pesticide-free and fertilizer-free pastures produces the sweetest milk and the tastiest cheese. All cheeses are made by hand in small batches from whole, fresh milk that is antibiotic and hormone free. Dorset, an award-winning cheese is this month’s Cave to Co-op featured cheese. Transfer the maple bread to a lightly oiled plate to cool. (Repeat the process with the remaining pieces of bread.) Smear a slice or two of Dorset into the bread and serve immediately. As the partial shutdown of the federal government continues, now the longest in U.S. history, the livelihoods of farming families are at risk, along with the communities that depend on them. In response, the Board of Directors of the National Farmers Union (NFU) recently called for an immediate end to the shutdown.